Get the all the information your need, on your favourite model mags. 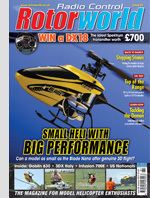 The biggest and best R/C Magazines resourse in the UK! Our Magazine pages our here purely for your information. We are not part of the publishing companies nor do we sell these magazine through our pages. All enquiries regarding content or subscriptions should be directed to respective publishing houses. Do you want to find that illusive article or find that plan you know you saw in one of the magazines? Or do you just remember the name of the article or a model review, but can't remember when it appeared? Search are databases and you could discover in seconds, just what you're looking for! Search our extensive index of magazines plans! Radio Modeller, 1970 to 1994.
some as early as 1951! with some records dating back to 1980. Just use our fully searchable index!